John Hagee is the founder of John Hagee Ministries. Hagee jumped on the four blood moons bandwagon in 2012 and 2013 with a book, DVD and even a T-shirt on it. John Hagee is a popular Bible teacher based in San Antonio, Texas and Senior Pastor of Cornerstone Church. He also has a regular TV broadcast on which in 2012 he covered the four blood moon theory of Mark Biltz. He released a DVD of that called the Coming Four Blood Moons. In 2013 he released a book called Four Blood Moons: Something Is About to Change. Personally, I was surprised to see such a mainstream megachurch pastor like John Hagee cover this speculative fringe tetrad theory. See my article analyzing the four blood moon theory to find out why. 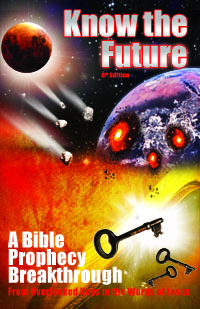 If you liked this article, you will LOVE my book, Know the Future, a comprehensive, literal explanation of end time prophecy read by over 25,000 people since 2005. Learn about Wormwood, the pretrib event that Christianity overlooks, even though a pretrib rapture won't save them from it. The book explains more on end time events than all this site's articles combined and is up-to-date in its 8th edition, in both softcover and ebook editions. Your book purchase will not only bless you with understanding and me with support, but you will also bless others with new articles that your support enables me to write. Jesus predicted that he will tell many sincere believers to basically "get lost" instead of welcoming them into the Kingdom. So...who are they and what did they miss or do wrong? In this study, get those answers and the one requirement for salvation Jesus taught (that Christianity misses) so that you can make sure you don't hear these dreaded words yourself! Join 30,000 subscribers receiving Tim's new articles and updates by email. Understanding Bible prophecy better will dispel your end time fear and bless you (Rev 1:3). Tim is the author of this site (since 1999) and the book Know the Future that explains Revelation literally at last--including the key event of Wormwood (Rev 6-8). To read more from Tim and not miss a single new article, sign up for his free newsletter above. Get the book from the interview here or read all about it here. Understanding Bible prophecy will bless you (Rev 1:3) and dispel your fears about the end times. Join my newsletter to start understanding prophecy literally.